Sultans of Swing is a landmark guitar recording. It appeared on Dire Straits’ debut album. The song introduced the world to guitarist Mark Knopfler. He is regarded as one of the masters of the instrument. At some stage Sultans of Swing is a must learn for all guitarists. This song is from the single note category in the VCE Solo Performance exam for guitar. You must select at least one songs from this category to meet the criteria of the exam (Compliance with the task). Be aware this is a long song. You have 25 minutes assigned to complete all requirements of the exam. Be sure you can complete all songs necessary within the time limit. Sultans of Swing was recorded on a Fender Stratocaster guitar. I recommend a guitar that has single coil pickups to replicate the sound. Use the bridge-middle setting or just the middle pickup. The guitar amp tone needs to be clean. You may like to add some compression to help with the dynamics of the solo lines. One of the unique features of Mark Knophler’s playing is he does not use a guitar pick. Try performing the song using your fingers. You will be able to achieve the percussive sounds of certain licks using fingers. Sultans of Swing should be approached as a string guitar solos. Treat each section as a solo to learn. I recommend cutting up the audio of each section and saving it as a separate file. This can be done using software such as Audacity or by creating playlists in the software Amazing Slow Downer. Intro – using the D minor pentatonic scale on 5th string. 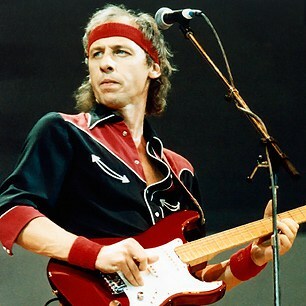 Verse 1 – Knopfler follows and outlines the chords throughout the verses. Learn the rhythm part by creating a chord chart. This will greatly improve your understanding of the licks in all verses. Verse 2 – this verse contains the first of the “monster licks”. This is found at 0:53 into the song and strings together the A major arpeggio with the Mixolydian mode. You can learn both of these for the technical exercises SAC. This verse ends with the famous guitar chord hook. Verse 3 – using the lyrics will help prompt you on what lick to play. After singing about Guitar George knowing all the chords Knopfler stabs out a chords lick. Some great country style string bends feature in this verse. Verse 4 – in this verse we start to see some licks repeated or slightly varied. Verse finishes with the hook. Verse 5 – once again some repetition of licks from earlier in the song. Hook to finish this verse. Solo 1 – the solo starts with soulful controlled string bends. No fast licks at this stage just very precise scale and arpeggio runs. Verse 6 – once again licks from earlier verses appear. Hook to finish. Solo 2 – licks now start to get fast and frantic leading into the famous arpeggio section of this solo. The recorded version ends with a fade out. Listen closely to how your selected backing track ends and follow appropriately. I recommend being able to sing the licks of all sections. You do not have to sing in pitch. This will assist you greatly with phrasing and keeping in time.